Not the Learjet I flew, but the danger zones remain the same. I can occasionally be a bit clumsy when I’m around airplanes. Not so much when I’m in them, just when I’m around them. I have walked into the (very sharp!) 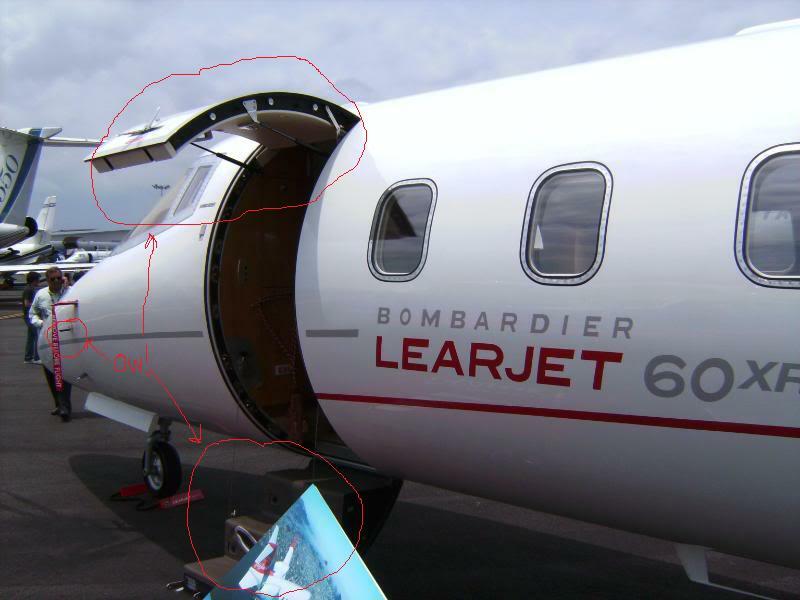 stall warning vane attached to the nose of a Learjet which resulted in a nasty bruise. I have closed the top hatch of the entry door on my own head (and you didn’t think it was possible!) and nearly gave myself a concussion. I have tripped down the stairs while exiting. You get the idea. But my most memorable tumble happened on a cold, winter night, right before departing St. Paul, Minnesota. I was flying a Cessna 310. It’s a light, twin-engine, propeller-driven aircraft which the pilot enters by stepping up on the wing to reach the door. While the ramp crew unloaded and reloaded my aircraft, I took the opportunity to hang out in the building’s warm lobby, use the facilities, check the weather, and get myself a cup of coffee for the next leg of my route. I had only been doing this route for a few weeks, and I was completely full of myself. Looking back, it’s a miracle I could even fit my big head through the 310’s door. The opportunity was ripe for kismet to knock me down a peg or two. Which, of course, it did. Yep. I totally fell off of one of those things. I grabbed my steaming, hot beverage, secured its lid, and headed out to my aircraft with a sprightly bounce in my step. As soon as I got both feet up on the wing, I slipped and tumbled off, my coffee flying in a graceful arc before plummeting back to Earth to completely coat me in liquid slightly cooler than lava as I lay dazed and flat on my back on the tarmac. It must have been hilarious – mostly because the only damage I suffered was to my immense ego – but I didn’t stick around to find out. I slunk up into the cockpit with my tail between my legs and pretended the whole thing never happened. It’s possible that no one even saw it happen, or it’s possible that the incident was captured on film and one of the ramp guys won a bazillion dollars on “America’s Funniest Home Videos.” I don’t think I want to know. 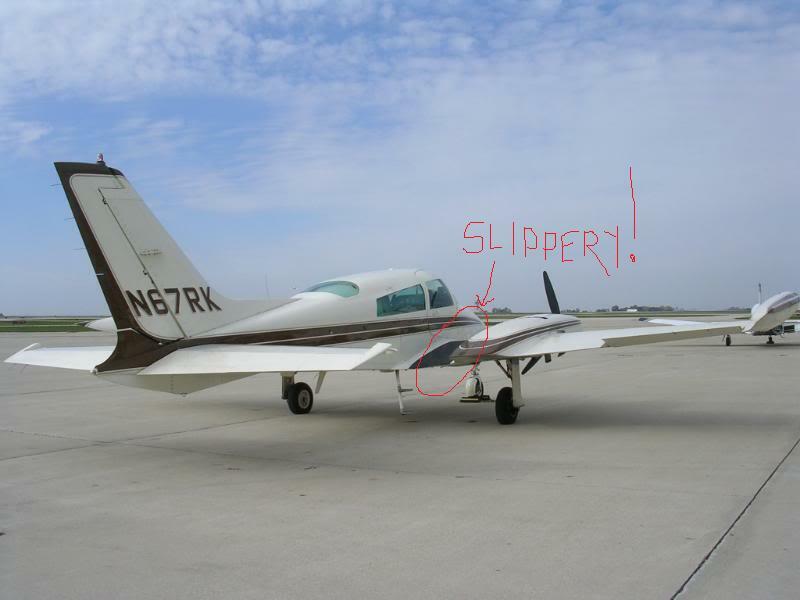 Think I will be more careful….I would hate to fall off an airplane! Eh, I’ve fallen off of worse. lol! You have a tail! The stories were true! Now, where do you keep the trident? When I was flying Lears, I almost fell out of the damn thing twice while opening the bottom door. Ask Kathryn about her “dismount” after we landed in LAS. Hilarious. I’m telling you, the things are hazardous. lol!